Sarah Palin and Her Juneau Neighbors Support Obama! An anonymous Mudflatter in Juneau was taking an evening walk past the Governor’s mansion, found the following political sign in the yard, and sent it to Mudflats for all to enjoy! 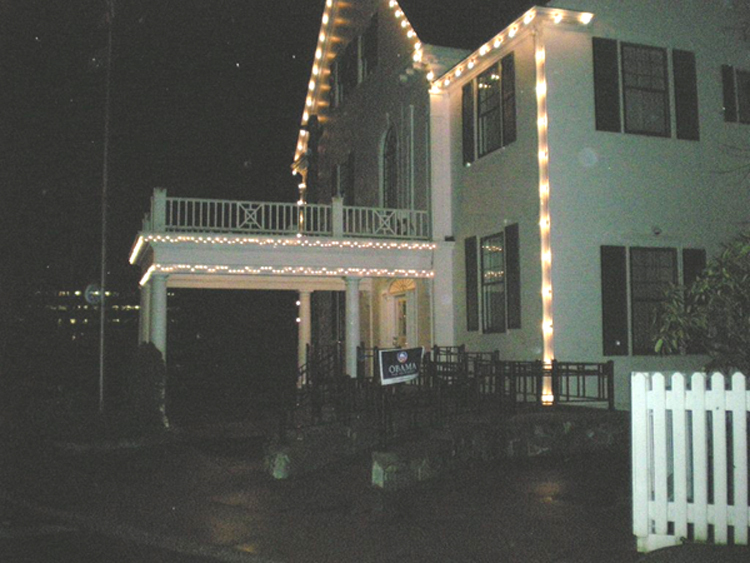 Presumably, the Governor herself is not an Obama supporter….however, it looks like quite a few of her neighbors are. The following images were passed on by a different Junea Mudflatter. I’ve circled the Obama signs, and pointed with a red arrow at the Governor’s mansion. Looks like Juneau is ready for change! 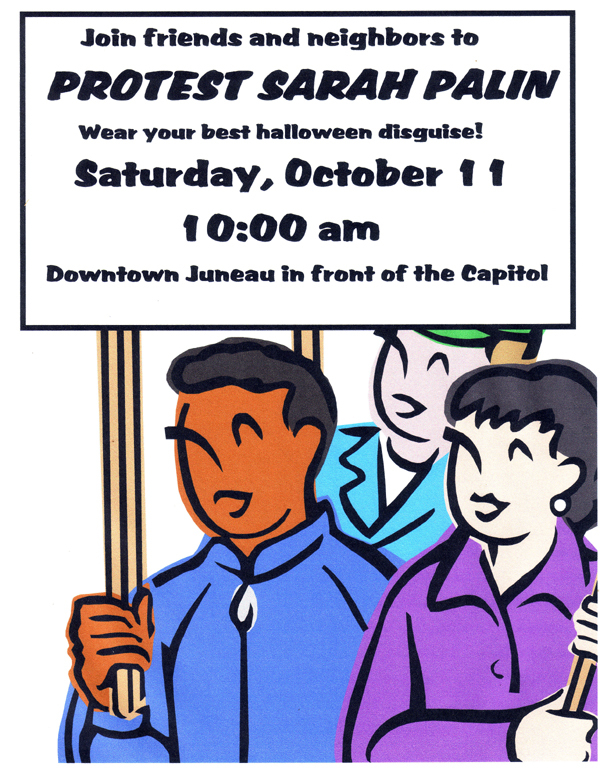 Saturday, all these Obama supporters in Alaska’s capitol will have an opportunity to make their voices heard! And in a “sensitive climate” where state workers are plentiful, participants are encouraged to wear their best Halloween disguises! The Release of the Branchflower Report. It was a long long day in the halls of the Legislature. What many thought would be a couple hours of waiting turned into an eight hour day. The hallway outside the conference room was jammed with media, ABC, BBC, CNN, NPR, the whole alphabet soup. There were bloggers and journalists, camera crews and members of the legislature, Palin folks and Alaskans for Truth – all staring at the clock, and each other, and waiting for any crumb of news. Every once in a while a legislator would pop out of the room and say, “It’ll be another hour or so,” and back they would go. Eyeballs pressed against the venetian blinds could see through the little string holes that Stephen Branchflower was talking, going through the report page by page. There were Hollis French sightings, and Bill Weilechowski sightings. Les Gara was there, as was Fred Dyson (one of the ‘gang of six’ who filed the lawsuit to stop the subpoenas). Palin’s spokesman Bill McAllister paced the halls. Shannyn Moore and Eddie Burke exchanged a brief hello. It was like a big melting pot of the Alaska political and media world in one little hallway…..all. day. long. The Palin supporters headed over for coffee at a local coffee shop, and after the coffee was made, they found out it was a “liberal” coffee shop and took off without paying, leaving the coffee behind. Finally, late in the afternoon, the doors opened and the 50+ members of the media flooded in to the room. Senator Lyda Green made the motion to release the public parts of the report to anyone who asked, and to not release the confidential portion of the report. Rep. Stoltze objected for purpose of discussion. Stoltze: He had some differences with the report, but thought the process was thorough. Felt the release of the report was a “no brainer.” It utilized public funds, and is a public document. He said he had received hundreds of emails from all over the country urging him to vote to release the report, and was hoping if the report was released he’d be able to get through his inbox again. Wilson: Felt the report was well done. There is some speculation in it and she doesn’t agree with everything, but feels Branchflower did a good job. The full report is more than 1000 pages. The public will not have all the information. Coghill: He was pleased with the professionalism displayed by Branchflower. He feels the politicizing has “settled down a bit” and didn’t feel it had an affect on Branchflower’s findings. Guttenberg: Thanked Hollis French, and Stephen Branchflower. Says to remember that the report is about “a family”. Feels that the legislature has done a good job and has served the public well. Cowdery: He “can’t fault the Palins for trying to defend their family,” but will vote to release the report. Elton: Thanked everyone for staying up late, going through the 1300 pages of the report. This was not an easy job. Thanked French and his staff. Thanked his own staff. Thanked Judge Michalski and the Alaska Supreme Court. By this time it had become pretty apparent that the vote would pass, and sure enough as the list was read, we realized the ruling was unanimous. I have to say I wasn’t expecting that. And now I’d like to thank all of you who spent time writing to the Legislative Council with your concerns about releasing the report, and passing the information to others. I have no doubt that this was a contributing factor. When Stoltze talked about all the emails he received, you could see the knowing looks on the faces of all those who were there. They knew they had an important decision to make, and they knew that people across the world were watching. After the vote, there was a mad scramble by the press to grab their homework for the weekend – a big fat 263 page green-covered, spiral-bound report entitled: Report of the Investigation of the Circumstances Surrounding the Termination of Former Public Safety Commissioner Walt Monegan and Potential Abuses of Power and/or Improper Actions by Members of Governor Sarah Palin’s Administration. Volume I – Public Report. The Legislative Council has voted unanimously to release the public portion of the report! I find that, although Walt Monegan’s refusal to fire Trooper Michael Wooten was not the sole reason he was fired by Governor Sarah Palin, it was likely a contributing factor to his termination as Commissioner of Public Safety. In spite of that, Governor Palin’s firing of Commissioner Monegan was a proper and lawful exercise of her constitutional and statutory authority to hire and fire executive branch department heads. Harbor Adjustment Service of Anchorage, and its owner Ms. Murleen Wilkes, handled Trooper Michael Wooten’s workers’ compensation claim properly and in the normal course of business like any other claim processed by Harbor Adjustment Service and Ms. Wilkes. Further, Trooper Wooten received all the workers’ compensation benefits to which he was entitled. The Attorney General’s office has failed to substantially comply with my August 6, 2008 written request to Governor Sarah Palin for information about the case in the form of emails. Everyone’s been waiting for the bottom line, so there it is! More to come soon. It’s 9:15 in Alaska, and the Legislative Council is meeting right now. The Legislative Council is expected to vote sometime today whether to make the 263-page report public. The legislators will first meet behind closed doors, starting around 9 a.m. this morning, to receive a briefing from Steve Branchflower, the investigator they hired to look into the governor’s dismissal of her public safety commissioner, Walt Monegan, and whether she improperly pressured him to fire a state trooper divorced from her sister. The meeting of the 14-member council will be at the downtown Anchorage Legislative Information Office. Meantime, a group calling itself “Alaskans for Truth” wrote a letter to Palin on Thursday saying the Supreme Court decision proves that “there is no evidence this investigation has been anything but ‘fair and just.’ ” The group organized an anti-Palin rally late last month, called for the attorney general to lose his job over his handling of the investigation, and encouraged people to urge members of the Legislative Council to make Branchflower’s report public. Drumming fingers on desk….looking at clock….drinking coffee….